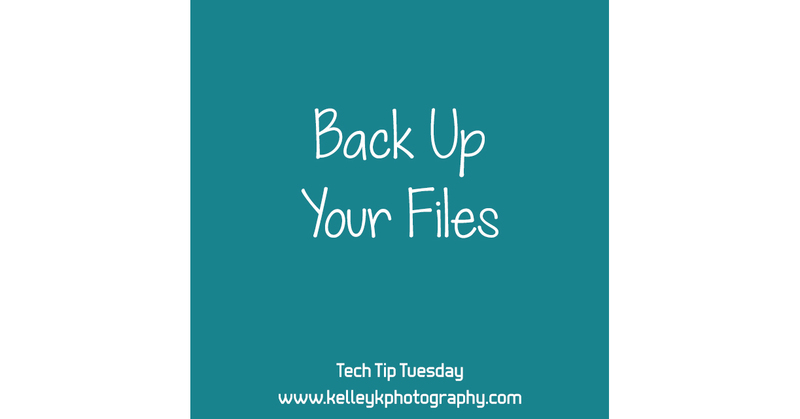 This is the first of my new “Tech Tip Tuesday” series that I am launching for 2017, and I thought what better way to kick off the new year than with some encouragement to make sure your computer backups are in order. If you aren’t currently backing up your computer, I’ve outlined a strategy to get backups started, and if you are backing up your files, there are some good tips in here to make sure all your bases are covered. People often think they’ve got everything backed up, but then their drive fails and they’re devastated to find out that they lost important files. If there’s anything that 20 years in the computer industry has taught me, it’s that all hard drives will fail at some point. It’s not a matter of IF your drive will fail, it’s WHEN. And drive recovery is very expensive and often cost-prohibitive (several hundred dollars at a minimum). 1. Backups should be complete. Even though my tips are geared towards photography tech issues, there’s a reason I titled this “Back Up Your Files” and not “Back Up Your Photos.” There’s a big difference. A lot of photographers focus on their photos when designing a backup strategy, but the reality is that there are a lot of other important files on your computer besides just photos. Think about all the files you have on your computer, including documents, spreadsheets, email, financial/tax records, etc. From a photography perspective, there may be presets, actions, and templates that you purchased or created yourself, as well as PDFs and videos of workshops or other educational materials. And if you’re in business, you’ll also have financial/tax records for your business, client information, marketing materials, logo files, contracts, templates, etc. Depending on your email setup, you may also have emails downloaded to your local computer, and your calendar and contacts may be stored on your local computer. If your hard drive were to fail today, you would lose all of this without proper backups. Plus years’ worth of photographic memories. For this reason, I strongly believe that your backup system should back up all of your files, not just your photos. 2. Backups should be automatic. You are constantly adding and changing files on your computer, so a proper backup will be constantly adding and updating files as well. If your backup strategy involves you remembering to copy files to a secondary drive or click backup on some recurring schedule, you’ll inevitably forget and you’ll have a chunk of time that isn’t backed up. Once configured, a good backup system should be hands off and not require human intervention. Automated cloud backups fall into this category, as do automated local backups such as system backups on Windows or TimeMachine for Mac. A backup system that automatically backs up your files as soon as they are modified or once a day or week takes the human element out of it. Otherwise, it’s very easy to forget to backup your files when things get busy, and then when your drive fails, you realize you haven’t backed up in weeks (or months) and you’ve lost all those files. 3. Backups should be redundant. Having your files backed up in one place is the bare minimum, which means you are maintaining two copies of your files. For example, you have a working copy of your files on your internal hard drive or an external drive, PLUS you have a full backup copy on a separate drive. If either the main storage drive(s) or the backup drive(s) fail, you’ll still have a copy of your files. But what if something happened to your backup and you didn’t know until your main drive failed? Or what if your main drive and your backup drive were both stolen or destroyed at the same time? Having your files backed up two places (so you have three total copies) offers much better protection. If your two backup locations are in different locations, that’s ideal. For this reason, I recommend having a local backup and a cloud backup. Local backups are faster to backup to and restore from, but online backups are in a secure location, protected from a theft, flood, fire, or other disaster that could happen at home. Online backups are also very easy to configure, often easier to restore a single file from, and may keep a better history than your local backup. Keeping history is important because if you realize a file got corrupted or overwritten, you can go back a week or a month and pull a previous version of that file. Using both local and cloud backup options available gives the best of both worlds. If you don’t have a local backup, I recommend you purchase a large external hard drive and setup automatic system backups. MacOS includes TimeMachine for configuring automated backups. Windows 10 has a File History feature that backs up user data, but if you want the ability to restore your entire computer, I recommend Macrium Reflect for system imaging. If you use an EHD for storage already, you will need to back that up along with your computer’s internal drive. I always recommend buying the biggest EHD you can afford, because your files and backups will only get bigger with time. I recommend getting at least a 4TB drive. I have scheduled a weekly system image, and have used it to restore my entire drive a few times after hard drive failures and it’s fabulous, because once you tell it to restore, you just walk away and it restores the drive exactly as it was with all the programs installed, files exactly where they were, etc. I have a Seagate Backup Plus 5TB external hard drive (purchased from Costco) and I’ve been very happy with it. I have another tech tip about external hard drives if you want to learn more. If you don’t have a cloud backup service or are looking for a new provider, I use and recommend BackBlaze. (NOTE: I am a BackBlaze Affiliate, but I only signed up for their Partner Program after being a satisfied customer.) We chose Backblaze because they have a great reputation in the industry, and they offer faster upload speeds and use less working memory on your computer than many of their competitors. Their software is also simple and easy to use, and requires no real setup – just install and let it run. The price is also lower than most other cloud backup services – Backblaze offers unlimited backup space (something that’s important to me) for only $50/year per computer. With any online backup service, your initial backup will take considerable time (weeks or even months, depending on how much you need to backup), but then it should easily keep up as you add/change files going forward. If you need to do a large restore, Backblaze will ship you a drive for a quick restore process, and you have the option to return the drive when you’re done so it’s free. I have personally used Backblaze to restore individual files for myself and my husband successfully used it to restore all of the files on a relative’s computer after a drive failure. Backblaze also keeps file history for 30 days for deleted files and disconnected drives, so you can easily download an older version of your file after it gets corrupted or accidentally overwritten. Just be aware that you do need to connect EHDs at least once a month for their backups to remain active. Many people use services like DropBox, Amazon Prime Photos, Google Drive, OneDrive, etc. and they consider that their online backup. While I like these services and think they have their place in sharing files and photos online for easy access from other computers or devices, they fall into a different category. They are online storage, not online backups, because they are not complete or automatic. They typically violate rules 1 and 2, because you have to manually put files in these folders for them to sync online, and they don’t include all the files on your system. I hope you enjoyed your first Tech Tip Tuesday! Comment below to let me know what you think, or if you have any questions about this or other topics you’d like me to cover in the future. Great tips Kelley! Backing up is so dang important — thanks for the reminder! Thanks, Rebecca! I’ve lost several hard drives over the years, and it’s so nice when you don’t have to stress about losing data when that happens. This is great and I have had this on my to do for a while. Question, will BlackBlaze backup an external hard drive? Backblaze will definitely backup external hard drives. They just have to be connected at least once a month. For Windows users, I’ve also found it useful to change the target of your default Document folders (e.g. My Pictures, My Videos, etc.) to point to the cloud storage directory. This way, all documents get automatically copied to cloud storage without having to remember to select the cloud directory. For example, the folder location for the My Pictures folder on my PC points to my OneDrive/My Pictures directory. While you can use cloud storage like OneDrive or DropBox as your primary documents and photos folder as you described, I prefer to only put documents on cloud storage as I need them. Cloud storage services charge for how many gigabytes of space you use, whereas cloud backups like Backblaze and CrashPlan offer unlimited space. I always recommend using a real cloud backup service rather than use cloud storage as a backup. I recommend using cloud storage services for convenience, like sharing files with someone else or easily transferring files between a computer and smart phone. Thank you for this! I do have a question! I have a mac and it’s programmed to back up with the time machine and it automatically backs up all my files to my external hard drive… my problem is that I have too many files on my main drive and I need to make some space.. how do I go about removing some files on my main drive while keeping them safe on my external hard drive and is that possible to do while using time machine? It sounds like you need another EHD to archive some files to. Then you’ll need to backup your Mac and your EHD to your other EHD. Or you could upgrade your Mac’s internal hard drive to something bigger. Awesome post, Kelley!! I already have a cloud backup service, Crashplan, but wanted to see what you use since Crashplan just announced that they are discontinuing support for home users. I can migrate my account to a small business account but it will cost me more. They are partnering with Carbonite, but I am not seeing as favourable reviews for it. I’m so grateful for your knowledge and insights!! Thanks!! !